Looking for a holistic way to treat your ailments? Want a nice quiet place to relax and get pampered? Brainstorming for something romantic to do on your date in Atlanta? Then you’ve made the right choice in visiting our website! Our experienced massage therapists are ready to give you relief in one of our many private body massage rooms. If you are on a romantic date, we can pamper both of you in one of our couples massage rooms upstairs. Our body massage rooms are dimly lit and have walls that are soundproof. We have top-notch massage tables and our sheets are always replaced with clean ones for EVERY customer. Foot reflexology is an ancient Chinese art and a featured specialty at Treat Your Feet Buckhead! We have developed a reputation in Atlanta of giving the best foot massages and for good reason. We have foot reflexologists that use techniques that will not only relax you but will rejuvenate you. There are over 7,200 nerve endings which are linked to every part of your body. When pressure is applied to these nerves, signals are sent to other parts of the body. Our reflexologists know which body part is linked to each reflex point in the foot. Once you have the experience of a relaxing but yet healing foot massage at Treat Your Feet, you will discover just how powerful and therapeutic this ancient art really is. Thank you to Atlanta Magazine for giving us this honor. 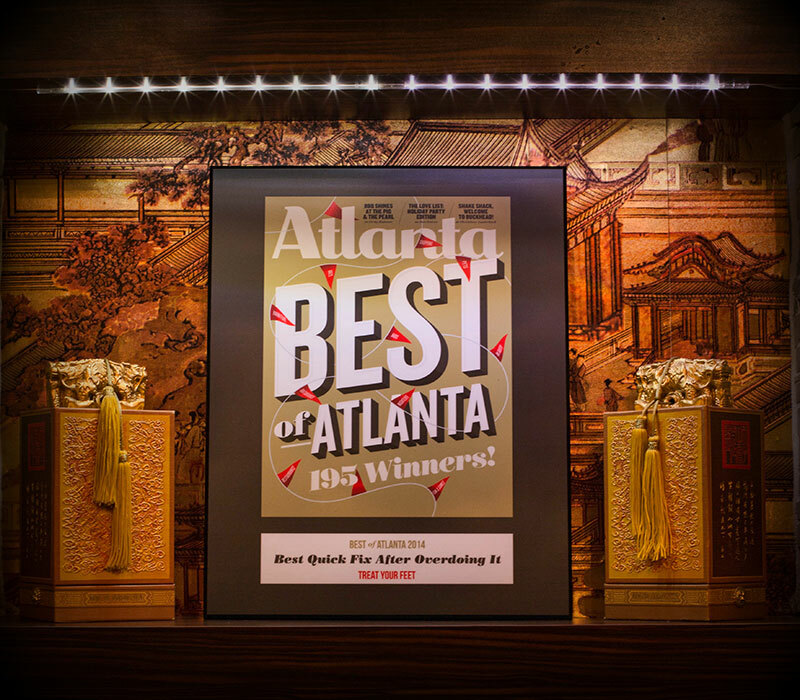 Our Buford Highway location won a Best of Atlanta Award in 2014 and 2015. We opened Treat Your Feet Buckhead in June of 2016. After being open for less than a year, Treat Your Feet Buckhead won a Best of Atlanta 2016 Award. Our massages are the best in Atlanta, and we ensure that our customers leave completely satisfied. Our massage therapy center has become a tourist attraction because of our outstanding reputation of giving high quality foot and body massages. Businessmen, businesswomen, and celebrities often come to Treat Your Feet because we are located less than a mile from the hotels they stay at in Buckhead. Although we are located in Buckhead, our massages are more affordable than most others in the area. Affordable pricing for the best massages in Atlanta is a reason to smile. Click or tap here if you are having problems scheduling an appointment on this page.